^ KSS win planning for new stadium. [2010-09-03] （英语）. ^ Albion Complete American Express Deal. seagulls.co.uk. 2011-01-20 [2011-04-21]. （原始内容存档于2011年4月13日） （英语）. ^ Falmer Webcam. [2010-09-03]. （原始内容存档于2010-07-29） （英语）. ^ Falmer Timeline. sussex.ac.uk. [2010-09-03] （英语）. ^ Brighton & Hove Albion announce first Amex game. BBC Sport. 2011-02-08 [2011-07-19] （英语）. ^ Gary Hart thanks Brighton for Amex invitation. BBC Sport. 2011-07-18 [2011-07-19] （英语）. ^ Club Signs Stadium Contract. [2011-01-25]. （原始内容存档于2010-09-04） （英语）. ^ The scheme (PDF). [2011-01-25] （英语）. ^ Falmer possible 30,000 seat future stadium. [2011-03-09] （英语）. 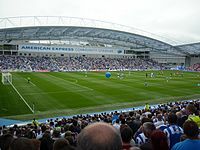 ^ Will Brighton and Hove Albion play in the Amex Stadium. [2011-01-25] （英语）. ^ The stadium. [2011-01-25] （英语）. ^ 12.0 12.1 The site. [2011-01-25] （英语）.